A 77-year-old man presents with 5-year history of infiltrative basal cell carcinoma (BCC) of the left ear fossa triangularis and root of helix. The area was originally treated with four weeks of radiation in 2014, complicated by temporary ulceration and healing with adhesion. When the area developed crusting a couple of years later, the patient used Efudex intermittently over the past two years. Mapping biopsies performed 09-06-18 showed sclerosing BCC and nodular BCC at two of the five biopsy sites. Mohs guided resection on 09-18-18 achieved clear margins. However, additional deep margin resection was performed and submitted for permanent histology. It found deep sclerosing BCC surrounding cartilage. Second additional wide local excision of deep margin was performed on 09-25-18. Although final pathology showed residual sclerosing BCC, true margins were clear. At that point, reconstruction was performed. 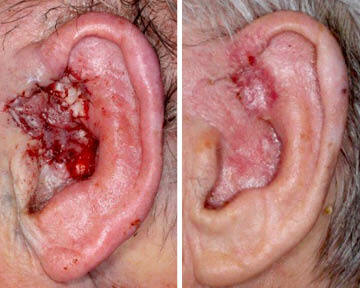 Radiation of thin tissues like the the ear helix has a higher failure rate. The root cause of radiation failure is hypoxia induced by vascular injury of radiation. Thin areas are particularly prone to this injury. Clinically it presents as ulceration and crusting. The danger is when this injury occurs at the edge of vascular supply of the tissue. In these areas, there is a risk of rapid radiation induced cancer melting and tissue ischemia. Cancer melting is associated with devascularization. Intuitively, this is a good thing. But the devil is at the edges of this phenomenon. Near the edge of cancer melting / devascularization / ulceration is less cancer melting / devascularization. The relative devascularization leads to relative hypoxia, which results in hypometabolic state of normal and some cancer cells. Hypometabolic cells are resistant to radiation therapy. So, radiation fails at edges of ischemic ulceration. 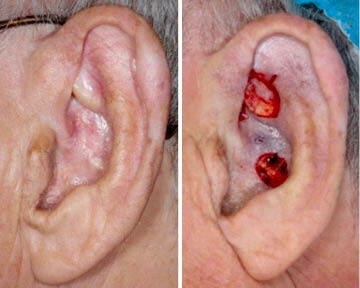 Pre-operative ear; ear post-Mohs excision of two sites. Additional deep surgical margin; multicolor specimen marking for pathology orientation. Flap in place; post-operative appearance after flap sectioning. In addition to the edge of ear helix, other danger areas are thin skin over bone such as medial canthus, and full thickness cancer involvement of scalp over calvarium. This can be minimized by decreasing radiation fraction and extending the treatment course to 8 weeks. The multicentricity of this patient’s recurrence was aided by his intermittent use of 5-fluorouracil. It likely achieved patchy cancer clearance and patchy cancer recurrence. Reconstruction was performed with postauricular superiorly based fasciocutaneous transposition flap. This flap relies on branches of superficial temporal artery coursing under the scapha. The thickness of the flap was required to match the depth of the defect. Tunneling of the flap created a sinus tract that was addressed a few months later with sectioning of the pedicle. Ear cartilage graft was used for support in the space of the resected tunnel at the second stage. High index of suspicion is required in following skin cancer treated with radiation therapy. When recurrence of skin cancer after treatment is suspected, look for deep recurrence with deep biopsies—punch biopsies or incisional biopsies. Mohs surgery is unreliable with deep recurrences after radiation therapy. But Mohs surgery serves as an important guide for additional wide local resection after achieving clear margins. The resected tissue is then analyzed with permanent FFPE histology. Intra-operative marking of resected tissue is aided by different histologic paint colors. The colors correlate the three dimensional specimen with recognizable anatomic landmarks. This guides with precision additional margin resection if so required.